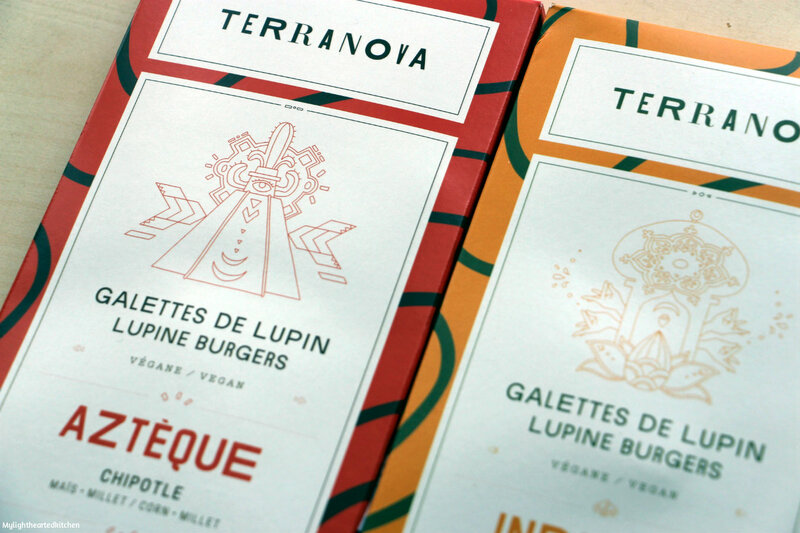 A few weeks ago, I stumbled upon Terra Nova burgers at my then local natural food store. 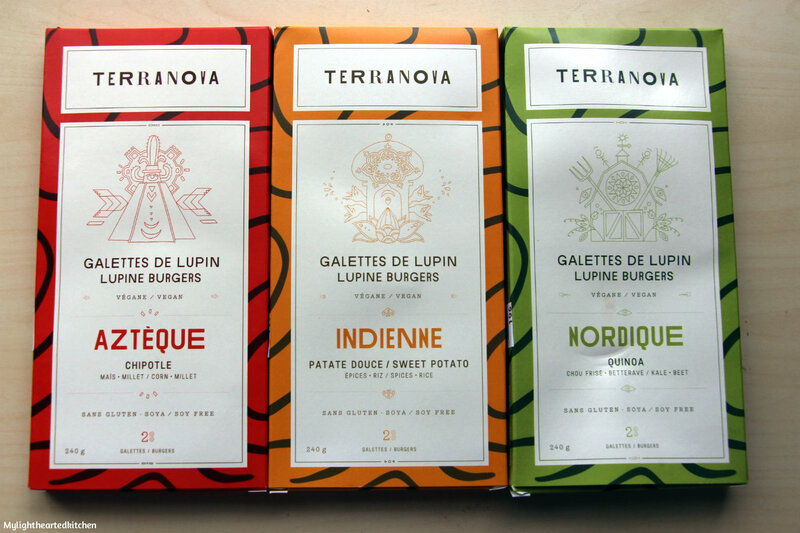 The packaging of these is just so gorgeous, you just have to stop and look at it. I feel like this is sometimes lacking in the vegan world: great packaging. Everything is green and brown for some reason. 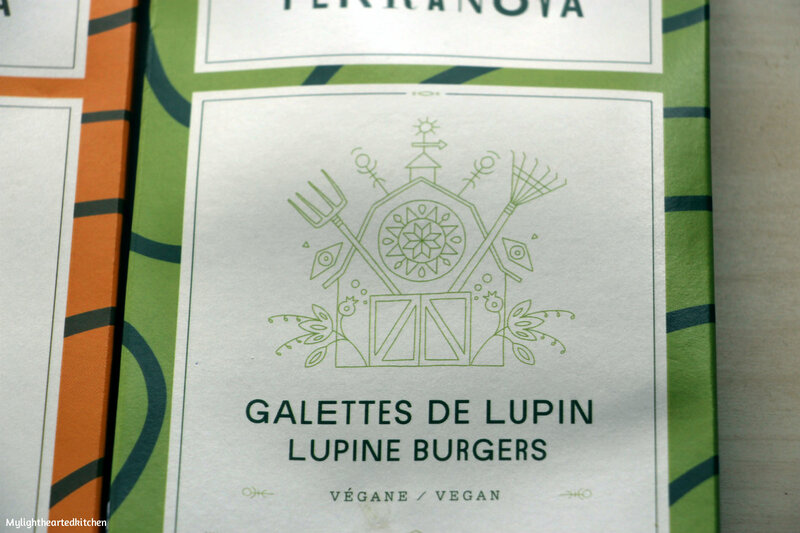 Anyways, after I was done batting my eyelashes at the packaging, I realized these burgers were something completely new to me: lupine burgers? This is really interesting because the lupines I knew were beautiful flowers. I realized that lupines are all part of the legume family, but some actually produce beans. Yum! So I quickly brought some of these burgers home, and I was really excited to try them out. Fast forward a couple of weeks. 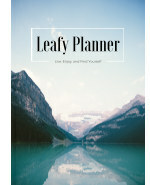 I contacted the founder of Terra Nova and asked if I could write this review. He kindly accepted and gave me all three flavors to test out. This is how I prepared these wonderful burgers. 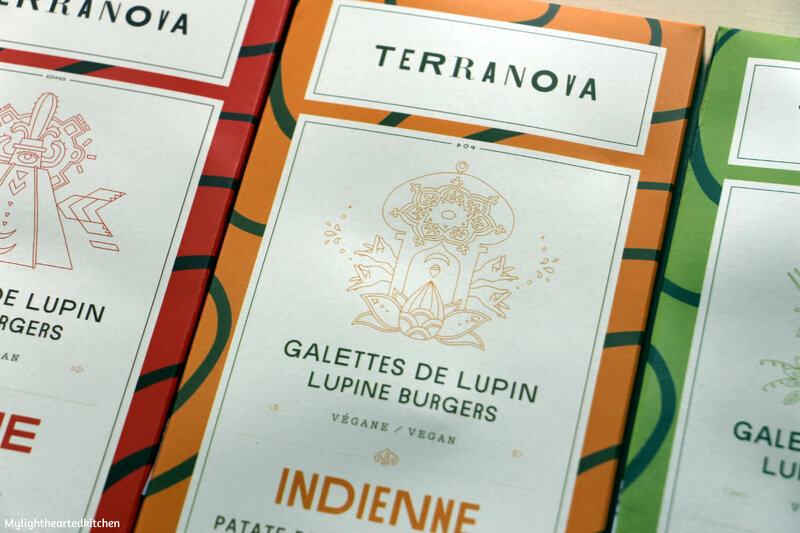 Overall, I have to say that they are a really nice change to other vegan burgers you can find: they are gluten-free, have amazing flavors and colours, and their texture makes them very versatile. Aztèque/Chipotle: Corn and Millet Flavour: These were the first ones that I tried out. I thought I’d go with the Mexican theme and use them in tacos. Great idea! I pan fried the burgers and crumbled them in the pan until I had nice golden flakes of goodness. I paired them with a simple tomato salsa, a cucumber salad, some greens and hot sauce. It was so much fun to eat these! The lupine crumbs were nicely toasted and had some heat to them, while also being crunchy and delicious. A completely delicious way to destroy burgers! Nordique/Quinoa: Kale and Beet Flavour: Now, this is probably the one flavour I was crazy excited to try out simply because of the wonderful colour. I mean, who doesn’t want to have a nice bright pink burger? It’s so pretty! I kept this one really simple: some garlic sautéed mushrooms with a sweet mustard sauce in a bun. D-E-L-I-C-I-O-U-S! My boyfriend ate his and was so disappointed that there wasn’t more. The burger is nice and moist and stays together well when cooked in the pan. Of all three, I think this one is my favourite. Indienne/Sweet Potato: Spices and Rice Flavour: Now, if you’ve been reading my blog for the last few weeks, you know that I have been waiting for my fridge to come in. We do however have a mini-freezer. So in the freezer these burgers went! When I was ready to eat them, I placed them directly in the oven. They came out nice and golden on the outside, and tender on the inside. Perfection! The Indian spices gave this a really special and wonderful flavour. We really enjoyed this one as well. I paired this with some corn salad and bread, which my boyfriend turned into a very beautiful open sandwich. Yum! I’m really glad I got to test out these wonderful burgers! I know that the recipes are still being tweaked because they are not completely satisfied with the textures, but I have to say I really enjoyed them as they are now. I find them very tender and full of flavour. I also enjoy that you can transform them easily to make up different recipes depending on your mood. Of course, I’m very curious to see how they evolve and become even more amazing. If I were you, I would keep my eyes open for these pretty burgers. They are available around Montreal right now, so go try them out!